A Hall Effect sensor is used to determine the strength of a magnetic field. The sensor is nothing but a transducer which can increase or reduce the voltage output which can then accordingly be measured by a voltmeter. The sensor can also be used to determine the position of a magnetic field by comparing the voltage fluctuations from an unknown magnet with that of a magnet which is in a known location. As a hall effect sensor can be used to detect a magnetic field, they can also be known as a switch. The hall effect sensors are used across a number of devices some of which include computer printers and photo copiers. One of the fastest growing applications for hall effect sensors is the consumer electronics sector. Following this, the automotive, and the telecommunication sector are the next sectors that are driving the demand for hall effect sensor. A number of consumer electronic devices have started incorporating electronic compasses as part of navigational equipment for the purpose of identifying the real-time location of the device itself. This is again a key driver which will increase the demand for hall effect sensors. Looking at the automotive sector, there has been a large volume of electronics which has been incorporated into modern day electronics which are used to control a number of functions such as the opening of doors, windows, fuel lid etc. Furthermore, it is also necessary for the electronics in the vehicle to monitor if everything is operating as it should. Hall effect sensors are essential in order to identify these functions. 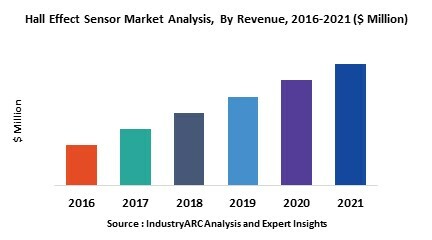 The APAC region is the highest contributor to the overall Hall effect sensor market with the vast majority of OEMs integrating the sensors in the devices in the region. The APAC region is expected to continue to be the leading contributor to the market till well beyond the forecast period.